1974 - 1975 23 Episodes on 6 DVD's This collection presents the entire first season of Little House On The Prairie. 1975 - 1976 21 Episodes on 6 DVD's This collection presents the entire second season of Little House On The Prairie. 1976 - 1977 This collection presents the entire third season of Little House on the Prairie. 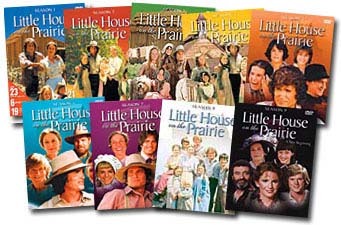 1977 - 1978 21 Episodes on 6 DVD's This collection presents the entire fourth season of Little House on the Prairie. 1978 - 1979 This collection presents the entire fifth season of Little House on the Prairie. 1979 - 1980 23 Episodes on 6 DVD's This collection presents the entire sixth season of Little House on the Prairie. 1980-1981 22 Episodes on 6 DVD's This collection presents the entire seventh season of Little House on the Prairie. 1981-1982 This collection presents the entire eighth season of Little House on the Prairie. 1982 - 1983 6 DVD's This collection presents the entire ninth season of Little House on the Prairie.